Paul Beston joins Steven Malanga to talk about the history of the American high school and making high-quality career training central in today’s high schools. This 10 Blocks episode is the second based on City Journal’s special issue, The Shape of Work to Come. In 1910, less than 20 percent of America’s 15-to-18-year-olds were enrolled in high school. By 1940, that figure had reached nearly 75 percent. The phenomenon became known as the American high school movement, and the impetus for it came from local communities, not from federal, or even state, government. Today, however, high school diplomas poorly prepare students for finding good jobs. Despite automation and competition from overseas, surveys of businesses consistently show that hundreds of thousands of positions in manufacturing firms go unfilled. One thing is abundantly clear: career and technical training in the U.S. hasn’t evolved to keep up with the transformation of the modern economy—and many schools have even slashed funding for vocational education. Paul Beston is managing editor of City Journal and author of the forthcoming book, The Boxing Kings: When American Heavyweights Rule the Ring. His story “When High Schools Shaped America’s Destiny” appeared in City Journal‘s special issue. Steven Malanga is the George M. Yeager Fellow at the Manhattan Institute and senior editor of City Journal. His story “Vocational Ed, Reborn” also appeared in the special issue. Brian Anderson: Beginning in the early 20th century, communities across the country embarked on an ambitious project to expand secondary education for American teenagers. This phenomenon became known as the American high school movement. Mass secondary education propelled the United States to the highest standard of living and best-educated population in the world. Today, however, American education is facing a crisis. The standard high school diploma doesn’t prepare enough students for the modern economy. Surveys of businesses consistently show hundreds of thousands of positions in manufacturing firms go unfilled due to lack of qualified workers. It’s clear that career and technical training in the United States hasn’t evolved to keep up with the transformation of the modern economy, with many schools even slashing funding for vocational programs. Dealing with the issue will require a massive shift in American education that centers on high-quality career training. 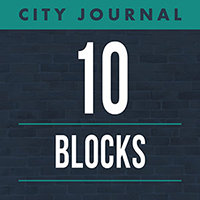 In this next episode of 10 Blocks, you will hear from two City Journal editors talking about their articles that appeared in our recent special issue, The Shape of Work to Come. Paul Beston, City Journal‘s managing editor, is the author of “When High Schools Shaped America’s Destiny,” and Steve Malanga, our senior editor and fellow at the Manhattan Institute, is the author of “Vocational Ed, Reborn.” Their conversation begins after this. Steven Malanga: Hi, this is Steve Malanga. I am senior editor at City Journal and I am here with Paul Beston, managing editor of City Journal, and as Brian said, we are here to discuss our pieces in the special issue about work. Paul, why don’t you start? You write about something called the American high school movement. Most Americans are familiar with what a high school is, but few of them kind of know how high schools came about in America and, particularly, what this movement was. And you talk a lot about this within the context of work in America. Paul Beston: Right. Hi, Steve. Yeah, the high school movement – I mean, most people haven’t really heard that phrase, and I had not until recently. It is traced to the years 1910 to 1940 in the United States by scholars who have studied it, and what it refers to is that before those years most American teenagers did not attend secondary school, or high school, and in fact most adolescents around the world did not. And it was a movement that arose due to changes in the American economy, starting in the late 19th century when the economy became more technological and when we saw the growth of industries like retail, and sales, and large manufacturing corporations with offices in multiple cities, and the growth of office work, with typewriters, and adding machines, and dictation, and stenography. And it became more and more apparent to employers that they needed a workforce that was better educated and suited to do this kind of work. And as late as about 1870 or so, only about one in ten Americans were in jobs that required education that went beyond elementary school. And, just a half-century later, in 1920, about a quarter of them had jobs that required at least secondary high school education. So, that’s an era of huge change and the country was trying to respond to that. And what is really interesting about the story is that the response was largely from the grassroots at the local level. It was not some large federal program. It was not declared from Washington. It arose in the states and in the localities, and parents wanting, as parents always do, their kids to be prepared for the challenges ahead. And, so, during the years from 1910 to 1940 these high schools went up. They practically doubled in number, from 1900 to 1920. The high school enrollment doubled in the country from 1900 to 1910, and then it quadrupled from 1900 to 1920, so these numbers just keep rolling over until by 1940 more than half of American teenagers were in high school. So, the high school as we know it, by you know, right around the war years, had become fully established in American life. Steven Malanga: And though it was a grassroots movement, it was one that was extensive, and widespread, and somewhat distinctive to America, right? Because what you write about is that at this point, really, American surpassed most countries in the world in terms of this notion of secondary education, and that really – we sustained that for decades. Paul Beston: That’s right. It’s completely unique to America, really, at the time. Because it has roots in, really, just our national traditions. I mean, it goes back to the common school movement where we started educating kids in elementary and primary grades, again, with the idea of educating everyone. There were no, you know, distinctions in this. We caught up with the European countries at those levels I think in around the mid-19th century, and then by the turn of the century and the early 20th century we were just well ahead of any country in the world in terms of secondary education because, again, of the democratic idea behind it was that everyone should go. Everyone should get themselves ready for the challenges ahead and Europe took a lot longer, into the 50s and then afterwards, to pursue the same goal. Steven Malanga: …so why don’t you talk a little bit about what started to undercut the movement? Paul Beston: Yeah, the movement was you know, like a lot of us remember, there were – excuse me – when we went to high school there was shop class, and vocational classes, and then there’s the academic track, and those things are familiar to us and those go, you know, pretty much back to the high school movement itself but what really worked in the early days of the movement was that even the kids that were in the vocational tracks studying for work, and, you know, not planning on going on to college in other words, they were getting pretty good academic curriculum. Pretty traditional, content-rich curriculum, whether in English or math. And that practice kind of tracked the kind of glory days of the movement, when the economy grew and when these kids did go into the workforce and were well-qualified for the jobs they had. And that just started to slowly water itself down, starting around the 30s and then in the 40s and onward. Educators increasingly began to see the two things as separate, they began to break them out. They began to not believe that the students that were coming in who were on the vocational track were capable of doing academic work, and so we saw a watering down of the curriculum standards, which is, you know, something we are pretty familiar with today. And then there also was, you know, in the 40s, were these whole kinds of educational fads, like life adjustment education, which wasn’t even vocational ed. It was just kind of vapid make-work sorts of curriculum, which was again a reflection of some of these educators’ belief that these kids weren’t really qualified to do complicated, challenging work. So, that was a really negative development and it has had serious effects. Steven Malanga: …and that students were sort of shuttled into. And the problem with that is that even blue-collar jobs gradually became more sophisticated, until you arrive at something like today, where you have auto mechanics who use diagnostic tools that are computer-generated. Steven Malanga: They plug a computer into your car these days. Steven Malanga: And you have manufacturing jobs, particularly the kind that America specializes in, high-value, manufacturing of high-value, sophisticated tools and machinery that require really advanced skills. And, so, our vocational schools have really not answered those needs. And the irony is we have this great discussion now about good blue-collar jobs leaving America to go overseas, but the truth of the matter is, if you look at surveys, many companies who offer blue-collar jobs will tell you that they still find it difficult to find people with the right skills. Steven Malanga: …it’s American-based operations here do apprenticeships with kids in high school, out of high school. In order to qualify for an apprenticeship at Siemens, to work on their manufacturing floor, you have to take advanced mathematics courses in high school and score an A or a B in them. 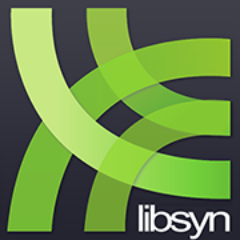 Paul Beston: …been the government role in terms of enabling these new efforts? Steven Malanga: …but actual work, which often requires some kind of cooperation with businesses. It is something that is very common in Europe but we don’t do enough of here in the United States. I believe in the United States there’s somewhere between 200,000 and 250,000 apprenticeships in the United States. That’s not nearly enough for the number of high school kids who decide not to go on to college. Steven Malanga: …and, you know, here’s the model, here’s the template. Steven Malanga: …an institutional bias against businesses. That’s one thing. Number two is you have, in order to be an instructor, in order to get the best instructors in these schools, you need people who are trained in these fields. These people often don’t have education certification. Therefore, they are technically not qualified to teach in schools, or to go into schools and teach. So, states and school districts have to change their certification requirements to allow more of these people in. There’s resistance to that also. Steven Malanga: And then there is the funding issue. 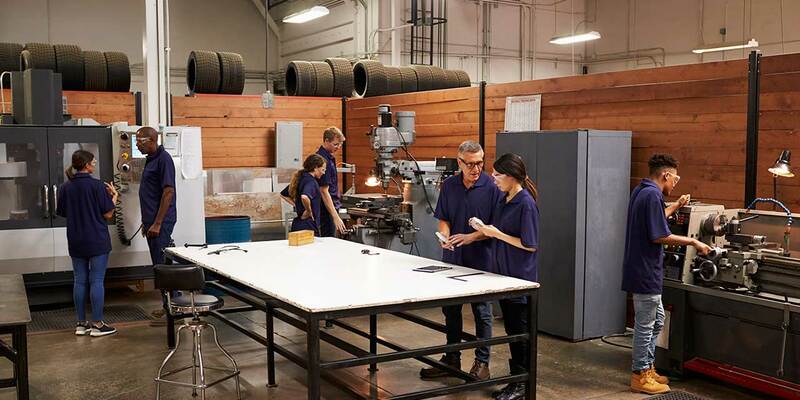 Because for a long time vocational schools have been funded at much less per student than regular high schools in many places, where, you know, these are places that, first of all, they not only quality instructors, but they also need equipment. And, so, we have to almost reverse the funding. This is one of the things that New York City did. We need to find money for them to do things like buy the latest equipment. Paul Beston: Have any political leaders you know, gotten out there in front of this in terms of support for it? Steven Malanga: Charlie Baker in Massachusetts and the Massachusetts legislature recently, you know, have gotten together and provided more funding for vocational education in Massachusetts. We are seeing the same thing in Michigan. In Pennsylvania, the governor there, Tom Wolf, recently signed legislation that changes the testing process for charter school, for education students in vocational schools. So, yeah, there are governors getting behind it. There’s a lot of work that has to be done. Paul Beston: You write in your piece, you know, you make the point that we’ve made it, you know, before. That for far too long we’ve really prioritized the four-year college track and seen that as the be-all, end-all. Is there any sense that you saw from working on this story that, you know, politically we are starting to understand this a little bit better – that there are more than one, you know, there’s more than one way to go about this and that some kids should be in these vocational programs and getting solid, high-tech jobs? Steven Malanga: Well, first of all, it is going to actually, I think, happen – it’s going to originate in the kids and the parents, and I’ll tell you why. One thing is student debt. The price of college has become so expensive that what has happened as a result of that is that a lot of kids realize now that, number one, only about half of all people who matriculate in college are actually finishing in six years. So, number one, you are building up a lot of debt, not even to come away with a degree. Number two, if you come away with a degree you are not necessarily guaranteed a job that is going to be the right fit for you in the marketplace, and, number three, now you get a look, particularly as these schools spread, you know. I’ll give you an example. In the Siemens apprentice programs in the Carolinas, students come out, it’s a six-year program. It is like getting an associate’s degree at a community college. But students come out after four years of high school and two years of community college, if they are qualified to work at a place like Siemens, they are earning $50,000 a year after six years of high school and college combined, so that’s attractive too. Steven Malanga: So, all of those things I think will gradually combine to create more demand for this. Paul Beston: Alright, well I think we are out of time here. This is Paul Beston, I am managing editor of City Journal and I have been talking with Steve Malanga, the senior editor of City Journal, about our stories and special issue, The Shape of Work to Come.